Mid-century styling meets mass manufacturing. By 1953, when this camera was released, Ansco was a "stand-alone" manufacturer and lost the Agfa. Their designs became more simple, plastic parts were more prevalent, and they were made in mass quantities to sell cheaply to the masses. 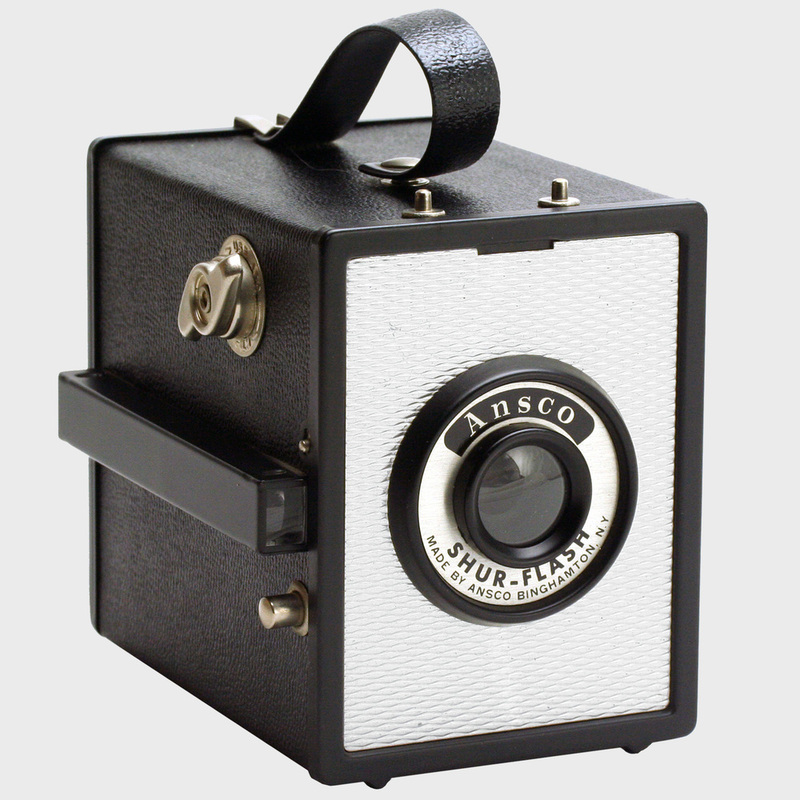 This simplicity, and consistent build quality, makes Ansco cameras really great shooters today. There are minimal parts, so minimal potential for failure - and of course they retain some* of The Agfa Ansco Advantage. This was one of the first box cameras tested by MFBOXCO in preparation for the launch of this website. It has some cool features, but they are balanced by other things that are not so good. As you can see in the photo, there is just one viewfinder and it's on the side. This is necessary to allow for the flash attachment on the top. The side finder can be difficult to clean, but it's fairly natural to use and makes it simpler to switch framing from portrait to landscape.. The pegs on the top of the camera accept a flash unit that uses M5 bulbs. MFBOXCO tries to keep a few of these attachments in stock and we provide a complete kit if you wish to experiment with flashbulbs. The pushbutton shutter release on the side is a nice change from the switches on most box cameras and adds to the sleek look. It's basically the same as the typical "Always Off" shutter, with just slight modifications. The camera is overall very simple and usable, and has the very attractive quilted aluminum faceplate, but when Ansco decided to go cheap, it created some drawbacks that you'll need to check for when buying a Shur-Flash. The other problem is the curved bar winder which is prone to corrosion and sometimes needs a bit of lubrication to get it working properly. Basically, if you find one in great shape, and especially if you find a complete set with the flash unit, it's a great looking camera that's super easy to use. Very nearly our lowest rating, but plentiful and accepts a flash, if you need.